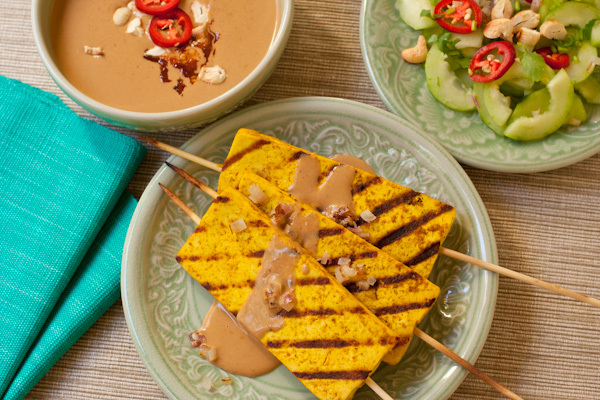 Pressing firm tofu creates a meaty texture that holds up to grilling like satay. Spicy sunflower seed sauce and Thai-style cucumber salad make for a refreshing meal. What’s a TofuXpress? It’s a handy little gadget that makes pressing tofu super-easy. When you press the water out, you can infuse more flavor into the tofu. In my next post I’ll give you a list of ways I use the TofuXpress. Cook 4-6 oz. of rice stick noodles or buckwheat soba noodles until tender. Rinse and drain well. Coat the noodles generously with sunflower seed sauce and stir until well mixed. Cube the cooked tofu satay and add it to the noodles. Mix in the drained cucumber salad. Garnish with chopped nuts, cilantro, mint, and red pepper slices. Heat the oil in a nonstick saucepan over medium heat. Add the curry paste and fry until it sizzles. Turn the heat to low and add the rest of the ingredients, stirring constantly with a whisk for about five minutes. Add additional water if needed to get the consistency you want. Served topped with chopped nuts (peanuts or cashews) and Sriracha sauce. Notes: Check the label before buying curry paste. Some brands have sugar, some do not. I avoid peanuts, so I make this sauce with sunflower seed butter or cashew butter, but the authentic version is made with natural peanut butter. My vegan fish sauce is not as salty as true Southeast Asian fish sauce, so you may need to add a little salt. Mix the first four ingredients in a serving bowl until well blended. Peel the cucumbers, remove the ends, and cut in half lengthwise. Use a grapefruit spoon to remove the seeds. Peel the shallot and mince. Fry it lightly in a small nonstick skillet until golden brown with just a touch of oil to keep it from sticking. Wash the pepper, cut off the stem, and thinly slice into discs. Wash and dry the herbs; mince finely. Let it stand 15 minutes for the flavors to develop. Garnish with chopped nuts. 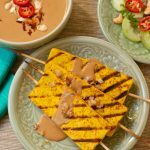 Delicious alternative to meat satay! Whisk together all the other ingredients in a bowl. Marinate the tofu for several hours or overnight. Soak the bamboo skewers for 30 minutes before grilling to prevent them from catching on fire. Heat your grill, grill pan, or broiler. Carefully thread the tofu onto the skewers. Spray the grill pan or broiler pan lightly with cooking spray, then grill the tofu for 3 minutes per side. Serve with spicy sunflower seed sauce and Thai cucumber salad (recipes above). These recipes are adapted from The Best of Vietnamese & Thai Cooking: Favorite Recipes from Lemon Grass Restaurant and Cafes . 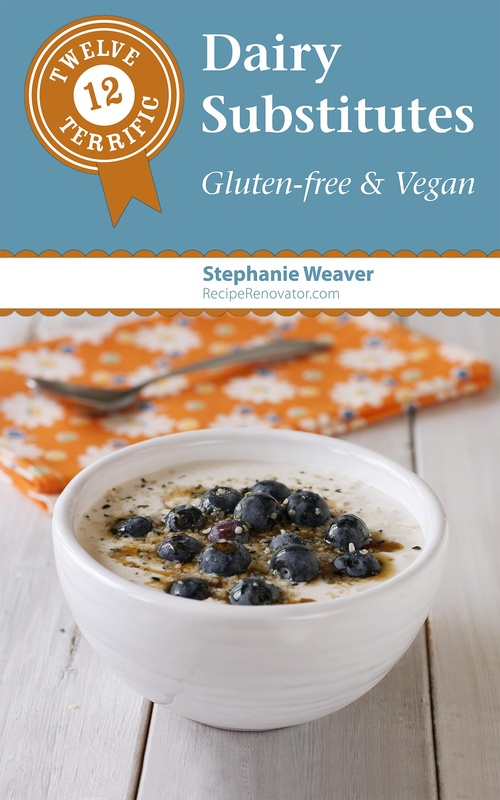 Love this cookbook! Totally would love to win one! I subscribed to TofuXpress’s newsletter!! I followed TofuXpress on facebook! I followed Recipe Renovator on Facebook! I have also signed up for the TofuXpress newsletter. I think i really, really need one of these! I liked TofuXpress on Facebook! I just liked Recipe Renovator on Facebook! Wow, not only does this tofu press look great, but thank you so much for printing these recipes and mentioning the cookbook! (We’re huge fans of the Lemon Grass restaurant in Sacramento, but don’t often make it there since we live 45 minutes away). Yum! I’d love a chance to give this press a whirl! Thanks for allowing me to enter to win my very own tofu maker. It will be a blessing. I signed up for the TofuXPress newsletter. Thanks for this giveaway! I follow TofuXPress on FB! I have been wanting one of these forever!!!! Guess I need to learn how to do this. I eat a lot of tofu, and now three of my four grown kids have celiac (a grandson gets tested tomorrow, but we know he has the gene from his grand daddy’s side. oh wow – for ages i used and loved a simple stainless steel press but the key piece got lost in a cooking frenzy two years ago. i’ve been lost and unable to find a replacement of any sort! this is a revelation! This is the first time I’ve heard of the TofuXpress but it seems fun. Plus this recipe looks really delicious. I also follow Recipe Renovator on Facebook. What Angela says is true. I am now following TofuXpress on Facebook. I would love one of these. I can never get enough water out of my tofu. This sounds tasty. What would you suggest I replace the coconut milk with due to allergies? I would love to win a TofuXpress!!! I already follow Recipe Renovator on FB. I just added TofuXpress to my follow list. I’d like to try the recipe for the cucumber salad – sounds great! The TofuXpress is certainly new to me…Looks like fun too! I need to win so @stacyblue will come over for dinner.